Some say that 19th century Tehran had six city gates. Other sources talk about seven or even eight. Of course, in the course of a few decades, one or two gates may have been added to serve the increasing traffic and expanding suburbs. Unfortunately, little to none is left of the city walls and gates that Tinco Lycklama saw during his visits to Tehran in 1866 and 1867. There is photography of these constructions, and it is quite possible that much material is still hidden in archives, waiting to be discovered. Unfortunately, many photographs available online seem to deliver conflicting attributions. 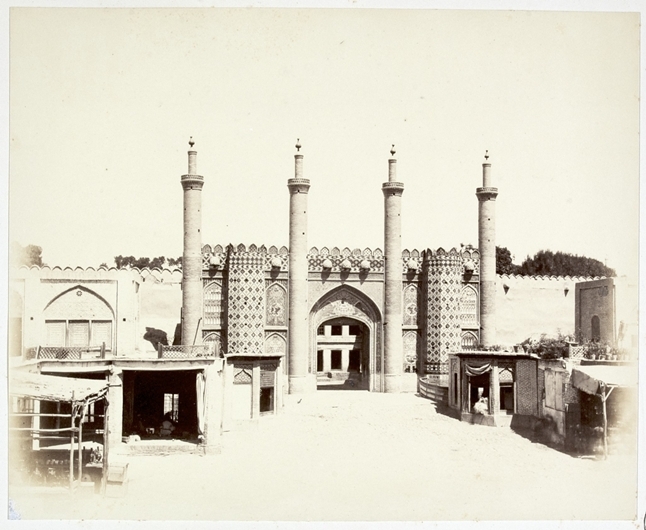 On this page, we wish to bring together a definitive and documented view on Tehran’s main infrastructure in the 1860s. As we wish to develop a visual reconstruction of the Tehran that Tinco Lycklama saw, this page will evolve and include photography (or, alternatively, drawings) that dates from as close as possible to the 1866-67 period. (Please note that “Derwazèh” is Tinco’s spelling of the more modern “Darvazeh” – meaning “gate”). The most contemporanean map of Tehran available to us today is the one made by August Krziz, an Austrian artillery instructor at the Dar-al-Funun – the Shah’s elite school. According to sources, Naser al-Din Shah engaged infrastructural changes in Tehran between 1869-1874 – which makes us believe that the August Krziz map is pretty accurate for how Tinco Lycklama found the city. Having said that, Tinco mentions seven gates, but the Krziz map only shows six in the city walls. One internal gate, namely the access to the royal citadel, could be counted as an additional gate, but this one is not mentioned by Tinco as a gate in the city wall. Thus, the gate we haven’t yet identified is Derwazeh-i-no (“new gate” – but Tinco definitely describes it as a gate in the wall. In addition, he tells is that a square adjacent to this gate served as a public execution ground). Perhaps Iranian sources (and yet-undiscovered maps) may reveal more to us in the future. Below, we first give the map by August Krziz, together with a schematic drawing. Next, we show the Krziz map as an overlay on Google Earth including the location of the identified gates (with thanks to the help of members the Qajar Heritage group). Further below follows again the list of gates described by Tinco, together with some photography. Some of the photos (Pesce, Montabone) dates from very close to Tinco’s time in Tehran. Others are of a later date but are probably representative of what Tinco saw. We will continue our research and update with better information and illustration, when available. (Thanks to all readers for any helpful advice). Posted on June 15, 2016 June 15, 2016 by George HomsPosted in Tinco explores Persia - April/November 1866, VoyageTagged Darvarzehs of Tehran, Tehran City Gates.